Something that the ‘non-metal folk’ don’t often grasp is that many times there’s beauty to be had in extremity. There’s an atmospheric side to metal, something that Morrow already have a firm grasp of with The Weight of These Feathers. An album that’s not afraid to be a bit emotive and esoteric as it winds through a haze of post-black, folk, and ambient influences. Keenly, this isn’t the type of thing for someone who wants to hear blastbeats ripping through the speakers from beginning to end. Morrow have crafted a moody and subtle trip with this release – one that moves between low-key and soaring, as well as floating around the esoteric and melancholic. It’s all about ebb and flow on The Weight of These Feathers, and understanding that each track doesn’t need to be a sprint to the finish. Some of the tracks are significantly long, but that doesn’t mean that they putter about and drag – instead the band wisely implements a diversity of textures into the music. For example, “Elysium I” features some post-black atmospheric and tremolo riffs (and a few blasts of course), but it also fixates on some gloomy guitar riffs that take a folkier approach and some guest female vocals. Elsewhere, “Allure” does right by its namesake with some sorrow-fueled strings to bring the listener into the fold before a slow buildup with clean guitar lands the band into more ‘post’ territory, complete with emotive riffs and screams (not to mention an enjoyable lead guitar). There’s also an element of quiet and minimalism at times, bringing the music down to a pensive lull, drenching the listener in some serene moments amid the heavier ones. 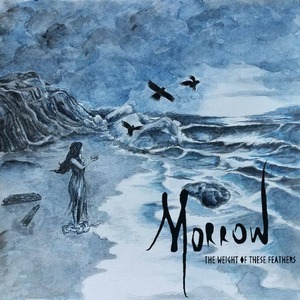 There’s some clear influences that Morrow leverages in their approach, but at the same time, The Weight of These Feathers lacks the familiarity that runs rampant through much of the ‘post-‘ directions. The type of album to get caught up in and search for those deeper meanings in life.